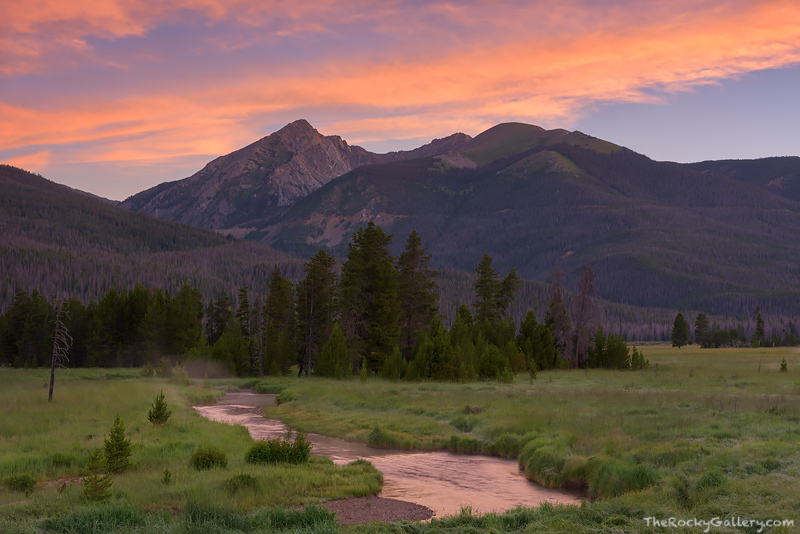 Only a few miles from it's headwaters, the Colorado River is modest as it flows through the west side of Rocky Mountain National Park. Even in it's modesty the Colorado River is the centerpiece of the Kawuneeche Valley on the west side of the park. During the lush summer months on the west side of RMNP, green grasses and willows line the Colorado River and Moose and Elk graze on the summer bounty the Kawuneeche Valley provides. This morning the skies turned pink over Baker Mountain making a colorful landscape even more spectacular to behold. Photo © copyright by Thomas Mangan.